When I saw this fine piece of electronics at the landfill I knew it was special. Not only did it have a plethora of nice looking knobs and various shiny areas, but it also had a wooden enclosure. Although stamped steel cases are nice, its a little impersonal, not like this finely crafted device. 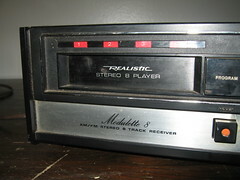 I had already thrown it in the trunk before I even noticed - the thing was an 8-track player.